﻿ Crew Resource | Dorval SC Tankers Inc.
Chemical tankers often carry dangerous cargoes or cargoes that are very sensitive to operate/control. As per international regulation, chemical tankers are fitted with special machines and equipment. Compared to dry-cargo vessels, the on-board systems are more complicated and high-tech. Crews of chemical tankers require high knowledge of dangerous cargoes and crews are expected to be familiar with hundreds of chemical characteristics, loading capabilities, and tank cleaning procedures. Dorval crews are well trained and highly experienced which is why we can operate our vessels in countries such as Australia which has one of the highest standards for port safety worldwide. This reliability is evident with the trust we have built with our Australian customers over a long period of time. The crew who operate Dorval’s fleet are largely from South Korea, China and Myanmar. With the support of manning agencies, Dorval has its own crew pool with excellent training. The crew pool consists of both experienced crew members and new young cadets. Chemical tanker knowledge is passed down to younger generations, overcoming difficult obstacles such as language and nationality barriers. Our partnership with a Korean manning company is strong with more than 30 years of a close and trusting relationship. This company has been providing Dorval with a steady supply of skilled officers and ratings. There are many Korean senior officers and engineers with experience of more than 20 years. In addition, the first batch of Chinese cadets are now beginning their work as senior officers/engineers. With the outstanding abilities of Korean, Chinese and Myanmar crew within the Dorval crew pool, we are able to always ensure safe chemical tanker operation. 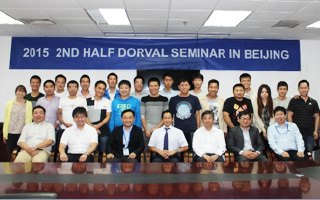 Dorval regularly collaborates with manning companies to conduct crew orientation for constant seamanship upskilling.